Heat oil in a saucepan over medium heat. Add shallot and sauté until soft but not brown, about 5 minutes. Add rice; stir 2 minutes. Add red wine; reduce heat to medium low. Simmer until wine is absorbed, stirring constantly, about 1 minute. Add 1 cup of hot stock; simmer until stock is absorbed, stirring often, about 3 minutes. Continue adding stock 1/2 cup at a time. 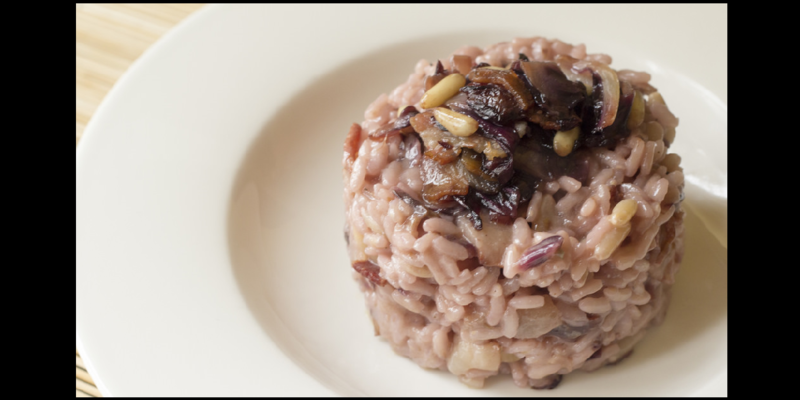 When the rice is almost cooked add the chopped radicchio, salt and black peppercorn.